It’s like poetry he said. And then he would read sentences and pause and look at me and say, isn’t that beautiful? Isn’t that amazing? And then he would keep reading. Typically Dave prefers non-fiction. But he loved this book. My sister loved this book. So when the holidays came and I knew I would finally have some time to read I picked up Lullaby for Little Criminals and read it voraciously. And I loved it too. 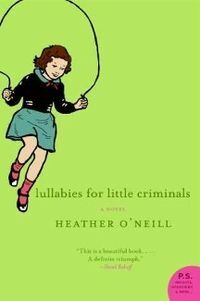 Although the book has been out for a few years now it was the first novel by Canadian writer Heather O’Neill. It’s an incredibly beautiful thing for a writer to create a character so compelling that you completely surrender to seeing the world from the character’s point of view and at the same time you remain outside of it just enough to hold your heart and say no, no don’t go there because I know where that will take you. And you know it because you’re an adult and you see the dangers that can befall the vulnerable. And in this case the person who is vulnerable is Baby, a young girl of 12 who lives with her heroin addicted father on the bad side of town in Montreal. And life ain’t easy for Baby. She and Jules move from one seedy apartment to another, she does time in foster care, and juvenile detention, she is practically fatherless and she is utterly motherless. And because she is a child she doesn’t realize what she doesn’t have. She knows she has Jules. And you hold your heart becuae sometimes she has friends. But not enough. And sometimes she has people in her corner but not enough and not the right ones. It’s only when she begins to traverse the uneasy road between adulthood and childhood that there is a growing awareness of what has been lost to her in her life. And as her beauty grows and her father disappears into his addiction the threat to her childhood and her well-being increases. And yet inside she is a child. A child who wants simple things. Love and a safe place both of which seem elusive. There’s a transitional moment in the book when she experiences a kiss and she acknowledges that there would be real consequences to that kiss and of course there are. But it’s that moment where you see a child slowly reckoning with the very adult consequences of something they’ve done and that’s been done to them. A kiss that should have been sweet and beautiful. And that moment in the book is beautiful and hard all at the same time because you witness her fragility and all the consequences that come with it. And it makes you want to cry. And the other moment is when she is locked out of her house and it’s late and cold and she has nowhere to go so she goes to her friend’s house. And the friend’s parents are assholes and turn the young girl away in the middle of the night. And it’s the final failure of adults in her world that sends her catapulting towards a very different life. And in the end ,just as the jacket copy says, she really has to figure it out herself. As we all do I suppose. But she is still a child. So wow. A heartbreaking book, a funny book, a book with a beautiful, real, raw voice of a kid who is just a kid and who doesn’t know any better and who doesn’t have a single person around her to help break her fall. So I would say go out and read it. It’s a beautiful heartbreaker.